It would be the height of absurdity for a fire department to receive a call of a burning house, rush to the scene and spray water on the houses around it because all houses matter. 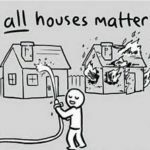 Do all houses matter? Of course. But you give the attention to the one that’s on fire. In much the same way, those who clamor “all lives matter” miss the point. 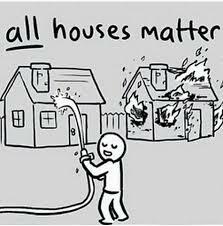 Do all lives matter? Of course. But you give attention to the lives on fire. The lives being snuffed out. The lives getting cordoned off. The lives neglected. The lives oppressed. The lives imprisoned. The lives that seem to be an exception to “all lives matter.” This is what the statement “black lives matter” is about. Are there folks supporting “black lives matter” alongside whom you might be uncomfortable standing? Is this your reason for staying silent? If so, do you use that same standard when it comes to your politics? For there are many under the Democrat umbrella and many in the Republican tent who are extreme versions of both of those parties – folks with whom you would likely be uncomfortable standing alongside. Yet that does not stop you from voting for a shared party of your preference. Or do you use this same standard when it comes to your faith? For there are many extreme elements within Christianity who profess to be believers. I would be uncomfortable standing with some of them, but that does not stop me from proclaiming myself a follower of Jesus. 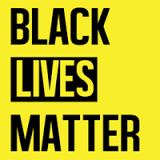 In a similar way, we have an opportunity in saying “Black Lives Matter” to stand up for the truth that these are lives being neglected… these are lives being persecuted… these are lives that continue to be singled out, ostracized, oppressed and outright murdered. And while we may not be fully comfortable with all of those under the tent of the black lives matter, movement, we realize that the central tenet is worthy of our voice and we will not be silent. Just as Christians are called to be salt and light wherever we go – in whatever political party, whatever denomination, whatever congregation, whatever community – so, too, we have the opportunity to be salt and light in this important effort. There is a place for conversation. There is a place for debate. There is also a time for action. A time for standing with others in solidarity. A time to pray and seek ways to be the hands and feet of Christ in this fight against racial injustice. There are ways to tackle this issue as individuals but individual issues are not the only forms racial injustice takes. There are societal and structural problems of inequality – from our educational system, to our housing system, to our justice system. If you do not know what these issues are – or what you can do – your first step is to learn: educate yourself. As you come to understand the issues, the next step is to take up the armor of God – equip yourself. If you know what to do and are equipping yourself to do it, the next step is to find where the battle is waging and join the fray. The issues of inequality are centuries in the making and they will not be overturned in a day. Will you commit yourself to joining the fray? It is a marathon. Not a sprint. And before, during and after everything else, will you pray? Far too often, the church has been complicit in the injustices against black people in this country – from opposing slavery’s abolition in the 1800s to perpetuation of Jim Crow and resistance to the Civil Rights Movement of the 1960s. Let us not be on the wrong side of this very real struggle, too. Will you make a stand today and commit to ending your silence? Will you preach and teach and pray and mobilize in your churches? Will you commit tonight to join in this effort? Again we say to our African-American brothers and sisters: We hear you and we see you. Our hearts break with yours, because we believe that black lives matter, but too often it feels like they don’t. Yours is a house on fire. We stand with you as partners of the true living water. And we are ready to fight beside you. We come before you today a fractured and broken people in need of your grace and grateful that you give it to us in abundance. Indeed, the events of last week demand no less of us than that we pause in grief and sorrow to mourn (yet again) the tragic, senseless killings of two African American men – Alton Sterling and Philando Castile – by police officers in Baton Rouge, LA and St. Paul, MN, respectively, as well as the ambush of police officers in Dallas, TX, on Friday, resulting in the equally tragic, senseless killing of five men – Brent Thompson, Patrick Zamarripa, Michael Krol, Lorne Aherns, and Michael Smith – and the wounding of several others that day, serving in the line of duty. Help us forbear with one another… endeavoring to keep the Spirit of Unity through the bond of peace. Because we don’t share the same perspective, the same common memory essential for Community, help us toward that end… to listen well to one another — learning to empathize with one another — to grieve with those who are grieving… and honor the Imago Dei in all. Help us stand together with those who are hurting, those oppressed and those ostracized, just as we saw You, our Savior, do in Your earthly ministry. To that end, help us to unequivocally affirm in word and action that black lives matter during this time when so many feel theirs are the only lives in the U.S. that don’t. And help us respect and honor those sworn to protect and serve, especially as we call them to a higher standard. I pray that our Restoration Movement would collectively recognize our own complicity in the perpetuation of our national original sin of racism. We confess, repent and ask for your strength and wisdom to work diligently for racial reconciliation and racial harmony. Finally, Lord Jesus, by the power of the Holy Spirit, help our churches become the churches You prayed we’d be. Perfectly one… Crossing all the social, ethnic, economic, cultural, political and generational lines that conventional wisdom suggests we need to keep the peace. May we instead offer a better story of visible unity in our churches under the banner of Christ alone – a unity that not only gives a glimpse of what heaven will be like, but also restores our credibility on these issues plaguing us today, and points people to Jesus as the only true hope for peace, justice and reconciliation. Travis Hurley joined Ozark Christian College in 2012. He serves as the Vice President of Development & Diversity. 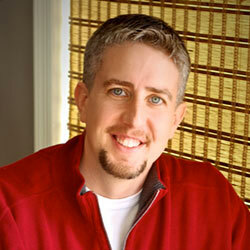 In addition to his work at Ozark, Travis also serves as the Director of Coaching for the Mosaix Global Network – a network existing to establish healthy multi-ethnic and economically diverse churches – and he is the Director of Dream of Destiny – the initiative seeking to foster greater diversity among ministry leaders and churches for which this blog is a part. A graduate of Ozark Christian College, Travis has an M.Div from Cincinnati Christian University and is a doctoral candidate at Gordon Conwell Theological Seminary. He has over twenty years of ministry experience, the majority of which was spent serving as the lead minister of a multi-ethnic congregation in the suburbs of Washington, D.C.
Travis and his wife Dena have four children and have recently been blessed with their first grandson, Jonah Travis.